How can services interact with programs that communicate with different data formats? Services may use incompatible schemas to represent the same data, hindering service interaction and composition. A data transformation technology can be incorporated to convert data between disparate schema structures. Mapping logic needs to be developed and deployed so that data compliant to one data model can be dynamically converted to comply to a different data model. Data model transformation introduces development effort, design complexity, and runtime performance overhead, and overuse of this pattern can seriously inhibit service recomposition potential. An XSLT style sheet containing data model mapping logic (2) is added as a form of intermediary processing that is executed at runtime. 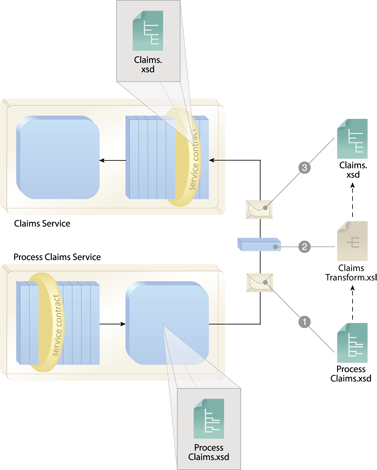 With each transmission, the data model of the claims document is converted from the schema used by the Process Claims service (1) to the data model compliant with the schema used by the Claims service (3). 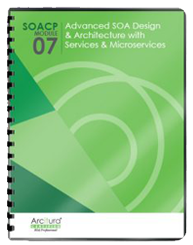 This runtime transformation logic can reside with either service architecture or as part of a separate middleware platform.